Bubba's grandmother bolted out the door and started screaming for Bubba. She didn't see him anywhere. She began frantically canvasing the neighborhood. Bubba can't talk so if anyone found him, he wouldn't be able to communicate who he is or where he lives. For a terrifying 20 minutes, Bubba was completely gone. Until a neighbor came walking down the street, holding Bubba's hand. The neighbor had found him 4 blocks away. Bubba's grandmother raced to give Bubba a big hug. He was soaking wet. No one, not even the neighbor, knows how or why he was wet. And Bubba is unable to tell anyone what happened. Robert "Bubba" Schaefer was born on June 8, 2010 in Wagoner, OK. When Bobby and Christa Schaefer met, they both had children from previous marriages. Bobby had 3 daughters and Christa had 1 daughter. 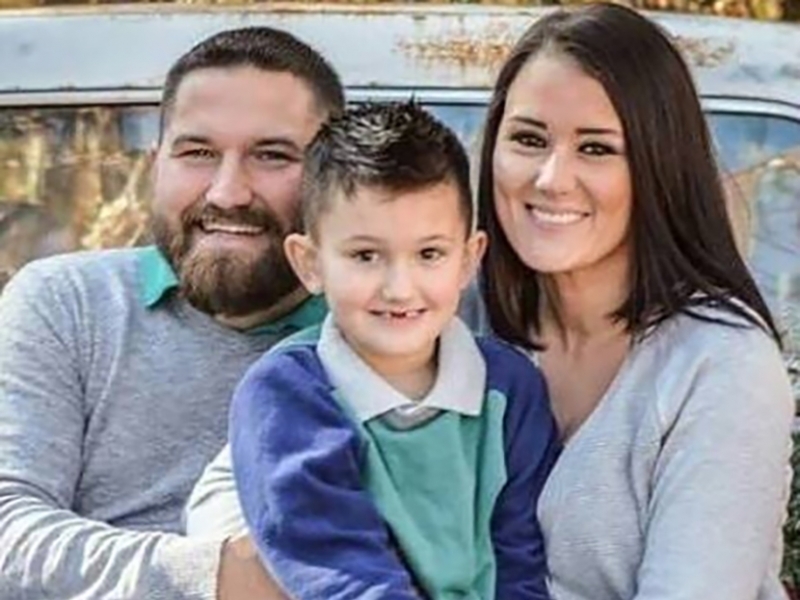 When Christa learned they were pregnant with Bubba, they were overjoyed to welcome a baby boy to complete their blended family. Bubba developed like a typical baby. He was even advanced for his age. He started walking by 8 months. He was speaking over 30 words by age 1. That's when things took a turn. Shortly after his first birthday, the Schaefers noticed he was losing his speech. Words he used to know and speak freely no longer came out of his mouth. The Schaefers enrolled Bubba in speech and occupational therapy. When that yielded no results, they scheduled an appointment with a developmental pediatrician. 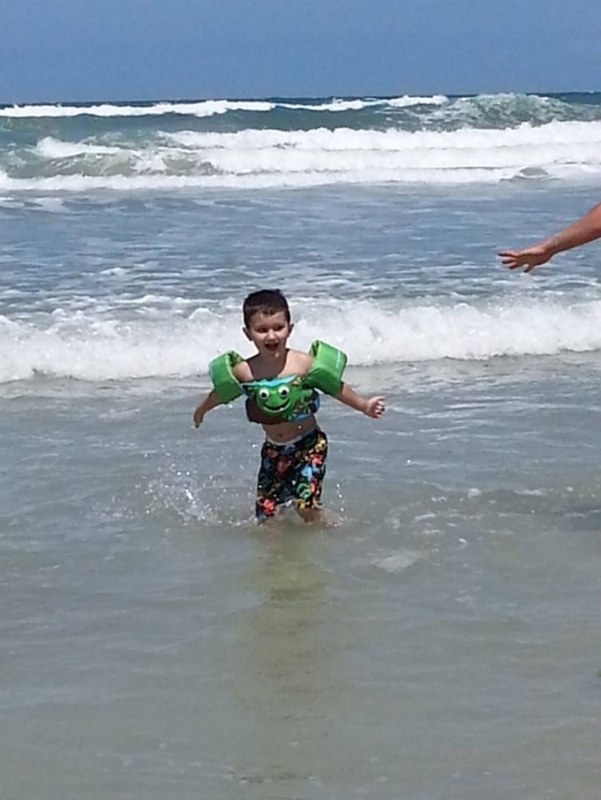 Bubba was diagnosed with mild to moderate autism, hypotonia (low muscle tone), and childhood speech apraxia. Speech apraxia is normally the result of some kind of brain injury, such as a stroke. Bubba had never experienced anything like that. 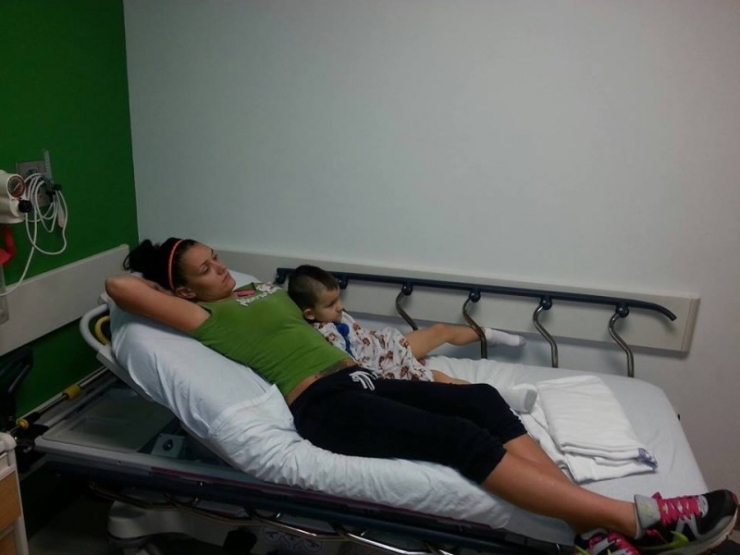 Bubba underwent an MRI and blood work to see if he had any kind of genetic abnormality. Every single test came back normal. 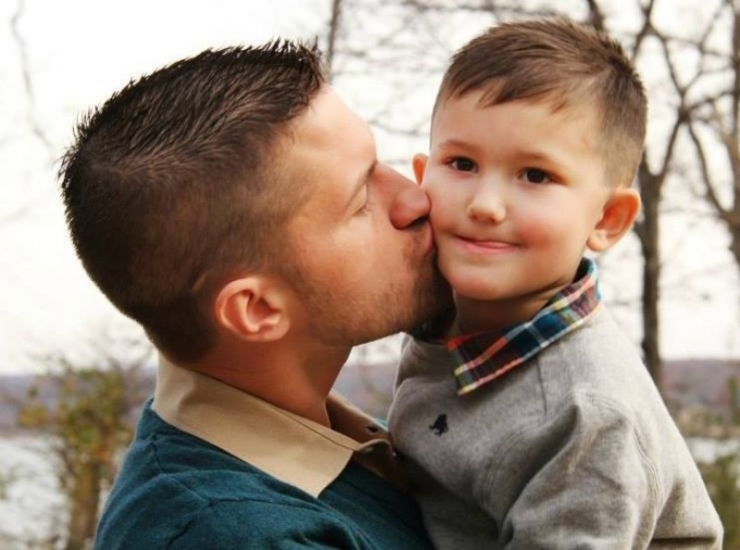 The doctor could offer no explanation for Bubba's speech apraxia. Childhood speech apraxia is a rare, neurological disorder where the brain is unable to send the correct signals to perform the motor skills to say the desired word. The disconnect is not due to muscle weakness or paralysis. The brain has problems moving the necessary body parts (lips, jaw, tongue) needed for speech. The child knows what he or she wants to say, but his or her brain has difficulty coordinating the muscle movements necessary to say those words. The news broke Christa's heart. "Nobody ever wants to hear that your child may never say 'I love you.' It has been a roller coaster of emotions for us all." Bubba is a smart and silly kid. He loves numbers. He's a very active boy who loves to be outside. He's always moving. He likes swimming, swinging, and jumping on trampolines. He has a sensitive side. He's affectionate, loving, and is quick to give a hug. If he sees his mom crying, he will wipe away her tears and kiss her face. Bubba is also a runner. Christa explains. "He runs constantly. You put him down, and he's gone." That's a serious problem, especially since he can't communicate with anyone who finds him. The Schaefers have tried to get Bubba to wear a medical ID bracelet, but Bubba usually figures out how to take it off. According to Christa, "It's scary, because the leading cause of death of kids with autism who are runners like Bubba is drowning." When you consider the time that Bubba ran off and came home soaking wet, the danger becomes very real. Bobby and Christa both work full time to provide for their family of 7. That would be no easy feat for any family, but Bubba's rising medical expenses make it that much more challenging. The Schaefers are in need of a little help. 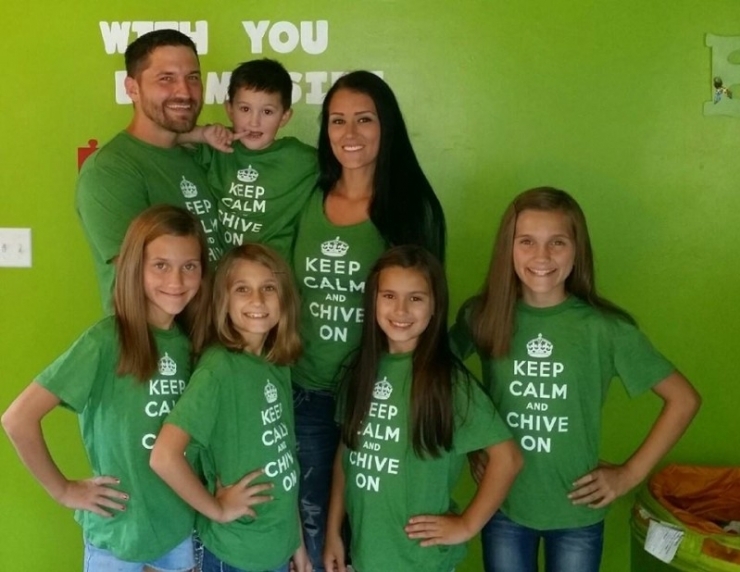 Chive Charities is proud to announce that we are donating a $27,000 grant from the Chive Fund! The grant will go towards a special trampoline with safety net, a cedar swing set, and other essential therapy equipment and toys. The most exciting part about the grant is we are also building a special safety fence that will keep Bubba from being able to run away. Bubba will be able to safely exert all his energy on the Schaefer's property using the equipment we are purchasing! Bubba absolutely loves the outdoors. He is most comfortable when he's in the water. Bubba is the center of his parents' worlds. 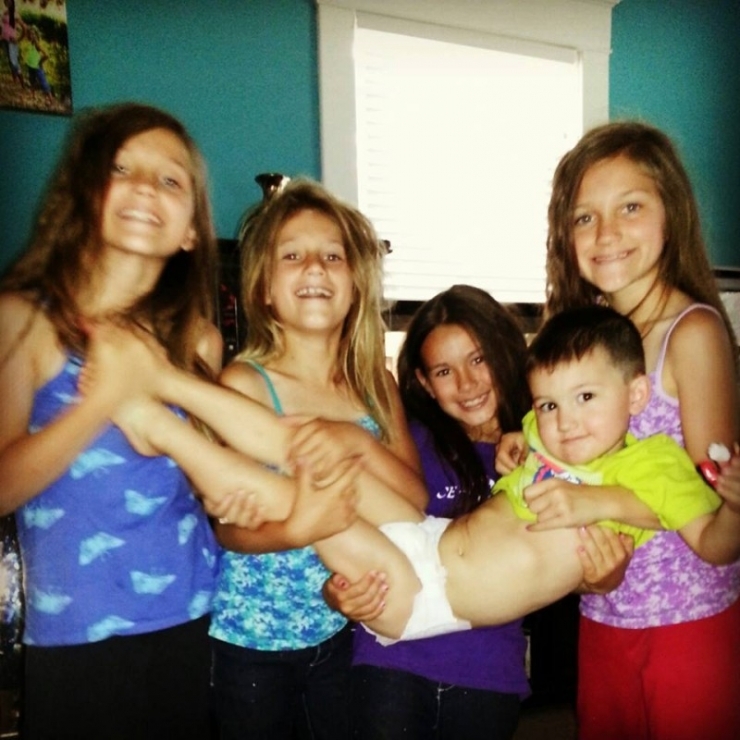 Bubba and his 4 sisters. They adore Bubba and love to help him. "He has 4 little mommas running around here," Christa laughs. 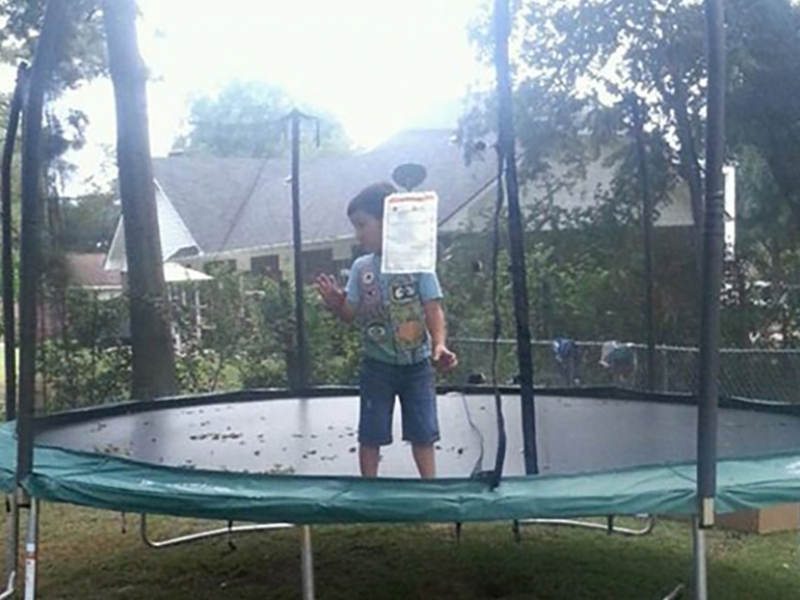 With the cedar swing set and trampoline, Bubba will have a safe way to exert his energy. 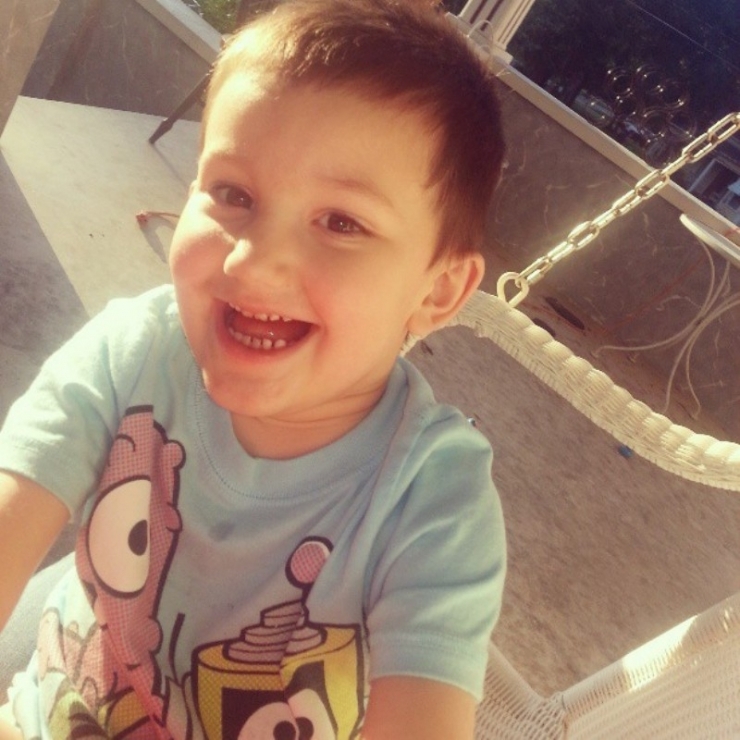 "Our biggest goal is for Bubba to be able to say what he is thinking," Christa tells us. "He struggles daily to try to tell us his needs. Every time he tries to tell us something, it is a guessing game for us. He tries so hard, but his brain won't let him get those words out." 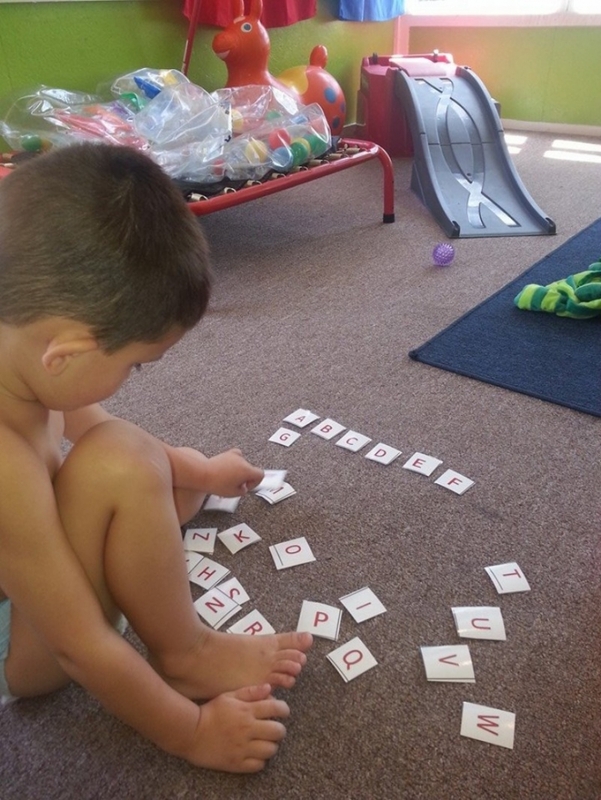 Part of the grant is going towards a language-building program to help Bubba learn how to communicate! Children with speech apraxia can become effective speakers with the right amount of therapy and hard work. We are confident that with his dedicated family, Bubba is on the right track. "The biggest struggle is wanting to do anything possible to help your child, but not having the ability," Christa confesses. "It's hard not knowing what is wrong when your child is hurt or scared; not knowing what your child wants when they are desperately looking into your eyes." 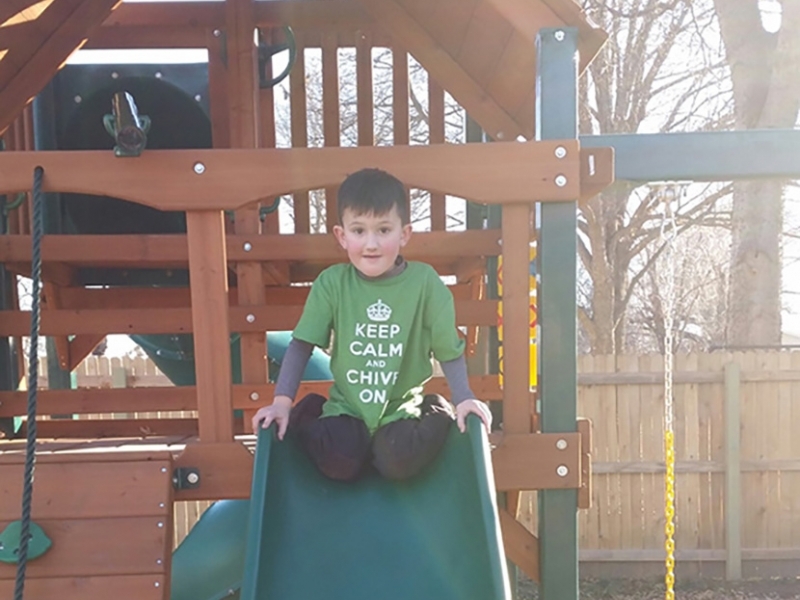 Thanks to your continued donations to Chive Fund and the $27,000 grant from Chive Charities, Bubba is on track to one day being able to communicate his needs. He will also have a safe way to exert all his youthful energy. The Schaefers will no longer have to worry about Bubba running away. The Schaefers have taken the challenges in stride. Bubba's sisters have stepped in to help wherever they can. "They are so good with him and try to teach him new things," Christa smiles. "They try to help him talk. When we have to make sacrifices because of Bubba's condition, they tell us they understand and it's okay. They love him so much." "We are a big, blended family…" Bobby starts. "But we're also not a blended family… if that makes sense." Christa explains what Bobby is trying to say. "Bubba brought us together. He's a blessing. He was the missing piece to our family."